Encompassing almost the entire town of Olympic Valley, the Squaw Valley resort sits right into the Granite Peak mountains. 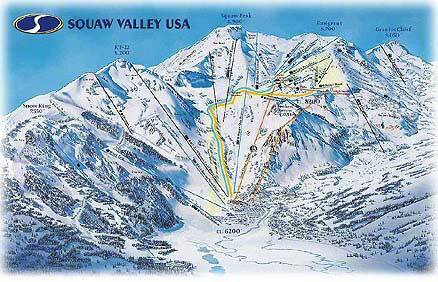 The resort is at the end of the road, surrounded by a quaint man-made village and has the infamous Squaw Valley Tram. Intermediate to advanced skiers love the diverse terrain, and the base camp at mid mountain has hot tubs for soaking (yes bring your bathing suit when you ski) and an ice rink for those who like to skate. The mountain is large, one of the 3 largest in Tahoe. It is days and days of fun. When you're lodging in Squaw Valley, you'll want to stay either in the town of Olympic Valley, or just outside in either Tahoe City or Tahoma or even Truckee to be the closest. You'll also be very close to take in Alpine Meadows and Homewood resort too.